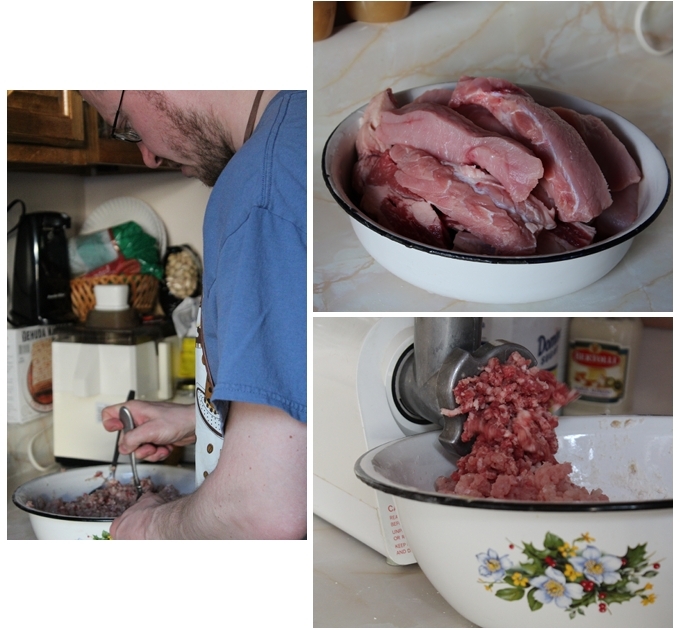 – Use a meat grinder for both meat and onion. Use a spoon to mix all ingredients well. We used half pork and half beef, the traditional combination I was told. You can use different kinds of meat, like lamb, chicken, or turkey, according to your preference. You can certainly buy ground meat but Mr. S and Mama would say it’s not the same ;) Also, we didn’t want the meat to be too lean, for flavor. Put the mixture in the fridge while preparing for the next step. 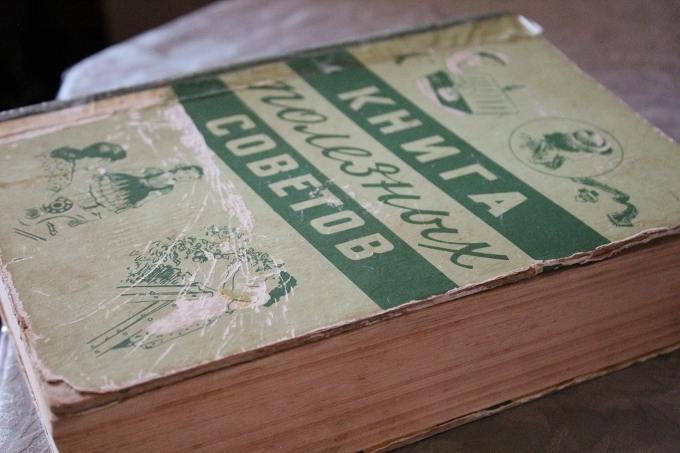 Writing this now, I realized that there are no photos for a step-by-step guide. I will try my best to give instructions. – Pinch off about a fistful-sized ball off the dough. Keep the rest of the dough covered while working on this portion. – Roll the ball between your hands to make a long, thin rod that’s approximately 3/4-inch in diameter. 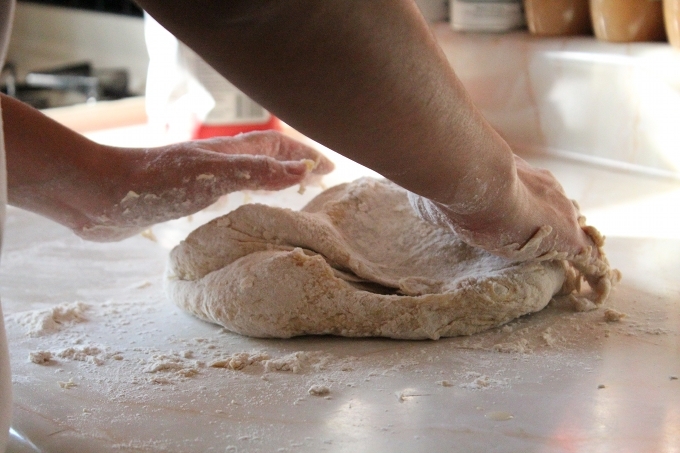 – Cut the dough with a knife to about 1/2-inch pieces. – Press the pieces, cut-side down, onto a floured, flat surface. Turn each piece over and press again. 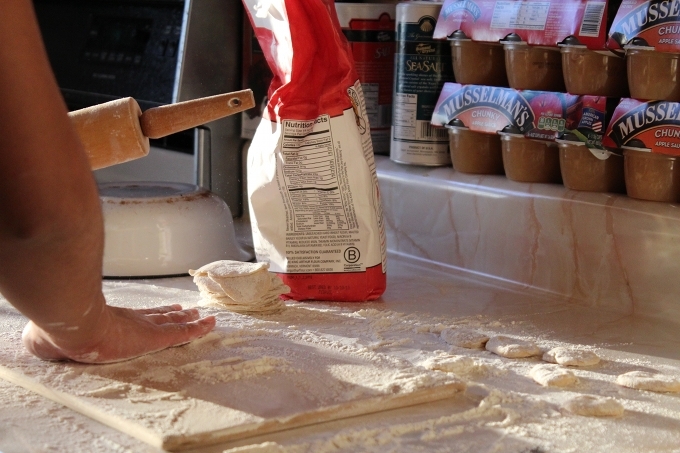 – Flatten the dough pieces using a rolling pin. Make sure both sides of the wrappers are well-floured so they don’t stick to each other. The wrappers can vary in size and thickness depending on how you like the dumplings. We found that we liked the smaller bite-sized ones. Also, if the wrappers are too thin, it might tear while putting the filling in or while cooking. – Take a portion of the filling out and keep the rest in the fridge. – The amount of filling placed in the wrapper will be an estimate, depending on how big the wrappers are and how meaty you want the dumplings. – Dab water on the edge of the wrapper to seal. 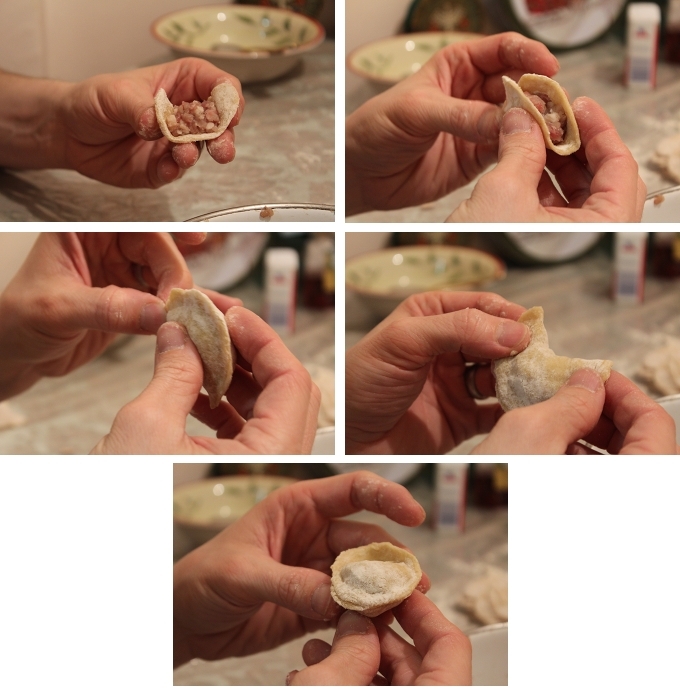 Please see photos above on how to form the dumplings. 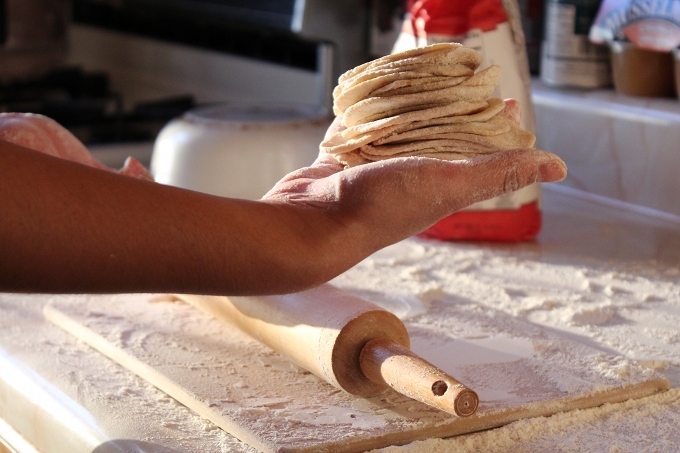 – Place dumplings on a floured board. Once you fill the board, put it in the freezer. When the dumplings harden, move them to a container or plastic bag for storage. It’s important to harden the dumplings first so that they don’t stick to each other in storage. This recipe yielded approximately 130 dumplings. They can last in the freezer for up to six months. 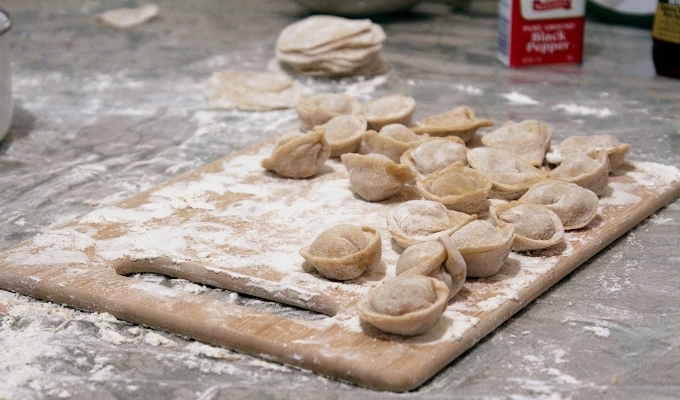 You can also store the filling and dough in the fridge and only make dumplings when you want to. Between the three of us, we were able to divide and conquer, and had our pelmeni dinner as a reward. 2 Comments for "Making Pelmeni"
Nice they remind me a llttie of Pierogi. I have to say that apart from Bortsch I’m not too familiar with Russian cuisine, and to be honest, I love your idea actually making dishes from a different region / country of the world fantastic way to try new things so I might have to give this a try sometime! (By the way, the Bavarians make a really nice beetroot salad consisting of sliced beetroot, thick slices of onion, olive oil and vinegar and a good amount of of ground cumin that’s really nice if you’re not a big fan of just beetroot). Hi! I know a little bit about Russian cuisine because my husband’s family is Russian, but we also love trying different kinds of food. Let me know how it works out if you try the dumplings. They’re time-consuming but fun and so worth it :) And thanks for sharing the beetroot salad.